In a given application a differential pressure switch may be used to maintain a disparity of pressure in separate parts of a system, or to keep the pressure in various parts of a system equalized. Differential pressure switches simultaneously measure the pressures at two different places in a system and compare them to produce a differential pressure reading. If the pressure is the same at both points, then the differential pressure will read zero, but if there is a difference in pressure between the two points, then the differential pressure reading will quantify the difference in terms of pressure – usually atmospheres (atm), Pascals (Pa), pounds per square inch (PSI) or bar. 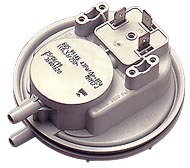 Differential pressure switches are programmed to react when the differential pressure rises or falls to a set actuation point, either signaling an alarm or automatically switching something on or off, for instance opening or closing dampers or louver, starting and stopping fans or motors and many other uses. Different kinds of differential pressure switches are designed to sense and react to changes in relative pressures of gases, liquids or both. Differential pressure switches are useful in a variety of different applications. In airplanes they are used to monitor and regulate the differential between the cabin air pressure and the atmospheric pressure as it changes throughout the duration of the flight. Oil filters for internal combustion engines are regularly equipped with differential pressure switches to measure the change of pressure across the filter. Differential switches can also be used to measure flow or level between connected pressurized systems or pressure vessels, since pressure tends to equalize within a free-flowing system. Differential pressure switches come in many forms, with or without either analog or digital displays, and in a variety of housing materials including acetal, brass, polycarbonate, plated steel, glass reinforced polyester, polyvinyl chloride and cast aluminum. Electronic pressure switches are the most common type of differential switches because they are easy to program and suitable to a wide range of pressures. Electronic differential pressure switches function by measuring strain on two separate piezoresistive, piezoelectric, or magnetic sensors that are connected to a digital interface module that shows the relative pressure. Differential pressure switches are important for the utility, automotive, aerospace, appliance, pneumatics and hydraulics industries because they are able to help manage the comparative pressures of different points within a system. Differential Pressure Switch Differential pressure switches sense changes in the relative pressure between two points and respond in a specified way. Differential pressure is one of the several types of measurement that are available for pressure switches.